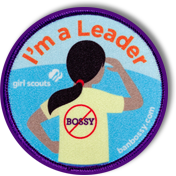 We are proud to partner with LeanIn.Org to bring you Ban Bossy, a public service campaign that helps girls flex their leadership muscles (and have fun doing it)—something we’ve been doing at Girl Scouts for more than a century. Ready to Ban Bossy with us? Volunteer with Girl Scouts today. Looking for tips on how to use Ban Bossy with your Girl Scouts? Volunteers: Watch this video for tips on how to use the troop activity. The BAN BOSSY and LEAN IN brands are owned by Lean In Foundation d/b/a LeanIn.org, used by GSUSA under license. Neither GSUSA nor LeanIn.org has granted a license to Girl Scout Councils or troops. As such, Girl Scout Councils may not create programs or products using the marks of LeanIn.org. In support of the program and in furtherance of the organizations’ respective missions, GSUSA is working with LeanIn.org to develop programmatic materials that will be distributed to Councils and troops at no cost. GSUSA and LeanIn.org also are collaborating on products that Councils/troops will able to purchase.